These relics are the physical remains of a saint. These can include pieces of bone or hair. These relics are items touched by a saint, also known as “contact relics.” Examples of second-class relics can include clothing or a rosary the saint used for prayer. These relics refer to articles that have come into contact with a first- or second-class relic. An example of a third-class relic would be a cloth that touched the tomb of a saint. 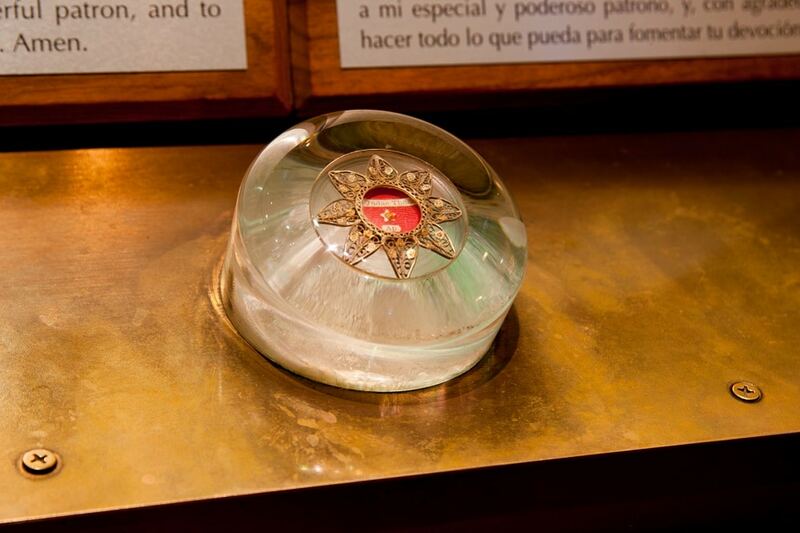 The National Shrine of St. Jude is fortunate to have two first-class relics of St. Jude. 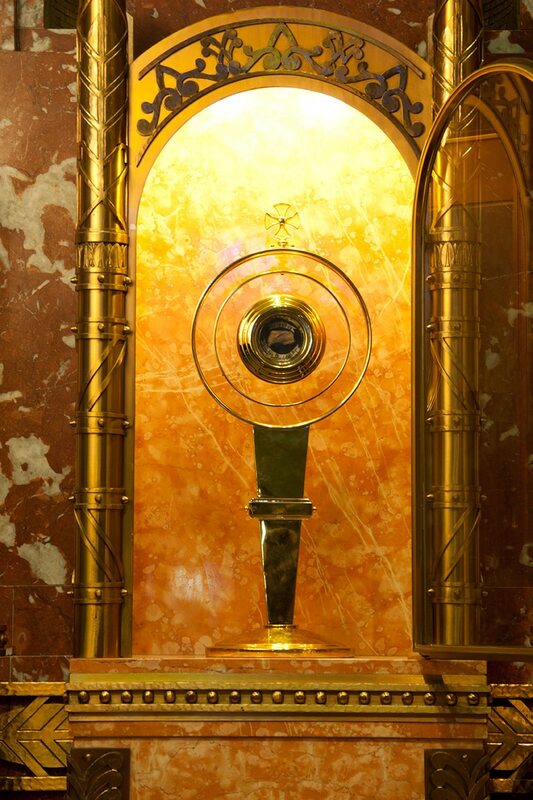 One is on display on the altar of St. Jude, in a gold reliquary placed in a glass cabinet. This is our large relic and reminds us of St. Jude’s complete love for God and of the complete reverence he gave Jesus as one of his Apostles. A smaller relic is located on top of the kneeler in front of the altar of St. Jude. This smaller relic is heavily protected in special glass and anchored in brass, which allows us to make it accessible to touch for all who visit the Shrine. Claretian Father James Tort, who founded the National Shrine of St. Jude in 1929, traveled to the Vatican in 1931 to procure an authentic relic of St. Jude. Pope Pius XI granted Father Tort’s request, allowing the relic to be venerated on St. Jude’s Feast Day during the October Solemn Novena. 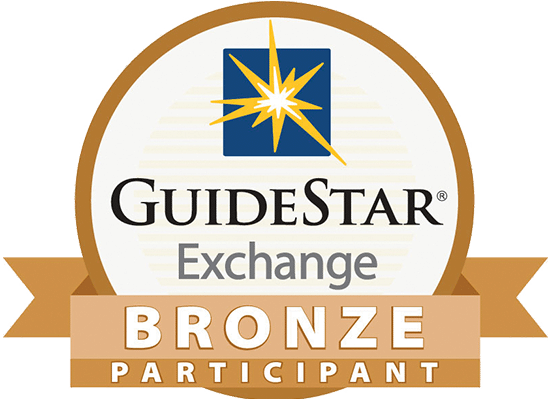 In 1960 and 1961, the Shrine received official certificates from the Vatican under Pope John XXIII verifying the relics of St. Jude. Catholics have venerated relics for more than a thousand years. Relics are mentioned in the Bible in 2 Kings 13:2021. The first known account of veneration of relics outside of the Bible was in A.D. 156 by the people of Smyrna. Their bishop, St. Polycarp, was martyred by being burned at the stake. His followers wrote, "We took up his bones, which are more valuable than precious stones and finer than refined gold, and laid them in a suitable place, where the Lord will permit us to gather ourselves together, as we are able, in gladness and joy and to celebrate the birthday of his martyrdom." One of the most well-known relics is the Shroud of Turin; the fabric believed to be the burial cloth of Jesus. "We do not worship, we do not adore, for fear that we should bow down to the creature rather than to the creator, but we venerate the relics of the martyrs in order the better to adore him whose martyrs they are"
However, St. Thomas Aquinas acknowledges that it is human nature for us to respect items related to those who have passed away. While a strong connection may be felt in the presence of a relic, the Catholic Church does not claim relics to possess any mystic powers.